This method for isolating functional immune cells from the heart provides an alternative to the conventional methods of collagenase digestion, which causes unwanted immune cell activation, resulting in a decreased responsiveness of these cells. Our method of isolation yields functional cardiac immune cells by avoiding problems associated with enzymatic digestion. McLarty, J. L., Meléndez, G. C., Spencer, W. J., Levick, S. P., Brower, G. L., Janicki, J. S. Isolation of Functional Cardiac Immune Cells. J. Vis. Exp. (58), e3020, doi:10.3791/3020 (2011). This method requires a familiarity with the anatomical location of the rat's xiphoid process, axilla and falciform ligament, and pericardium of the heart. These landmarks are important to increase success of the procedure and to ensure a higher yield of cardiac immune cells. These isolated cardiac immune cells can then be used for characterization of functionality, phenotype, maturity, and co-culture experiments with other cardiac cells to gain a better understanding of their interactions. Autoclave 1 L glass beaker, 1000 mL graduated cylinder, and stir bar. Reconstitute the HBSS powder solution in the autoclaved 1 L glass beaker to the 900 mL mark with double distilled water. Mix HBSS solution with 3.4 g of Hepes Na+ salt and adjust the pH to a value between 7.35-7.41 using either concentrated HCL or NaOH. Once the desired pH has been attained and remains stable, add 5 g of bovine serum albumin to the solution at room temperature until the albumin is completely dissolved. Add 10 mL of the antibiotic, antimyotic, to the solution and double distilled water until the total volume is at 1000 mL mark. Filter the HBSS solution and separate it into 50 mL Falcon tubes for later use. Additional tubes can be frozen and used at a later date. Prepare a tray with required instruments and material for insertion of a tracheal tube (i.e. forceps, scissors, tracheal tube, 3-0 black braided suture, small animal ventilator, etc.). Once the rat is completely anesthetized with a ketamine/xylazine cocktail in the ratio of 2 ketamine to 1 xylazine, shave the abdomen, chest, and throat of the rat. To ensure that a deep anesthetic state has been achieved, pinch the rat's toe and check for pedal withdrawal of limb. Make sure the rat is deeply anesthetized before making all incisions. Make a skin incision from the mid-abdomen to below the lower jaw. Dissect away the muscles of the anterior triangle of the neck to expose the trachea. Place a 3-0 black braided suture under the trachea. Make an incision in the trachea between the cartilaginous rings and insert the tracheal tube. Tie the suture tightly to secure the tracheal tube to the trachea. Connect the tracheal tube to a small animal ventilator. Prepare two 10cc syringes, fill one syringe with HBSS for introducing the buffer into the pericardial sac and reserve the other one for aspirating the HBSS containing cells. 3.2.1. Reduce the Teflon tip of the 24 gauge Baxter intravascular over the needle quick-cath (1.6 cm) by 1/2 to 3/4 of its original length for the isolation procedure. Place all syringes, buffers, and an empty 15 mL Falcon Tube (to hold the extracted fluid once procedure is finished) on ice. Make a midline incision in the abdominal wall (along the linea alba) until you reach the xiphoid process. Starting slightly laterally to the xiphoid process, make bilateral incisions through the rib cage continuing at an angle toward the axilla. Be careful not to perforate the lungs, heart, or pericardium. Once the incisions on both sides of the sternum are complete, dissect away the diaphragm from the lower ribs, cutting lateral to medial. Note: Be ever aware of where the pericardium connects to the diaphragm and sternum to avoid damage. Use the falciform ligament as a landmark to note where the pericardium is attached on the opposite side of the diaphragm. Also, if the pericardium is cut, the ability to isolate cells is lost. Gently lift one side of the ribcage to expose the thoracic cavity and the heart (still encapsulated by the pericardium). Take the HBSS filled syringe and find a point in the pericardial sac approximately half way between the sternum and the heart (preferably more rostral than caudal) and insert the Teflon tip of the shortened quick-cath through both layers of the pericardium. Once the catheter is in place, proceed gently fill the pericardial space with 2 to 3 ml of HBBS buffer. You will know immediately if the catheter is properly placed when you notice the pericardial space expanding. If no filling is witnessed, withdraw and reposition the quick-cath. When the pericardial sac is filled, take the other 10 cc syringe and place the tip back in the pericardium and begin aspirating the buffer. The same entry hole can be used or another can be created. Make sure the tip does not come too close to the walls of the pericardial sac while providing suction, especially on the underside of the heart. This could lead to puncturing the pericardial sac and loss of cell-containing cells. While aspirating the buffer, the catheter tip can be moved around inside the pericardial sac in order to collect as much buffer as possible. Note: If in doing so you slightly tear the pericardium and make the hole at the top of the heart larger than the original hole, don't panic. As long as the pericardium still surrounds enough of the heart you can still perform another wash over the heart albeit with a lesser amount of buffer. For collection of an optimal amount of cells, three to four additional washes are needed. Place the extracted buffer into the Falcon tubes that were placed on ice. Remove heart, lungs, and/or any other tissue if needed for further studies. After the collection of immune cells and other tissues, the rat must be rapidly and humanely euthanized. Centrifuge the collected immune cell samples for 10 min at 200g at 4°C. Always keep the tubes on ice when not in use. Remove the supernatant and reconstitute the pellet in 1 mL of Hyclone Buffer or HBSS. Note: It is important to count the number of immune cells obtained from each heart after the immune cell isolation procedure. An example of isolated cardiac mast cells obtained with this technique and stained with toluidine blue and safranin O/ alcian blue are presented in figures 2A and 2B, respectively. As can be seen in Figure 3, The cardiac mast, maintained their ability to release histamine after treatment with known activators such as compound 48/80 and substance P as described in Morgan et al.9Representative scatter plots from flow cytometry of CD4+ cells and CD8+ cells are presented in figures 4 and 5, respectively. T-lymphocytes are further identified and phenotyped as a cell population from this technique. Figure 1. 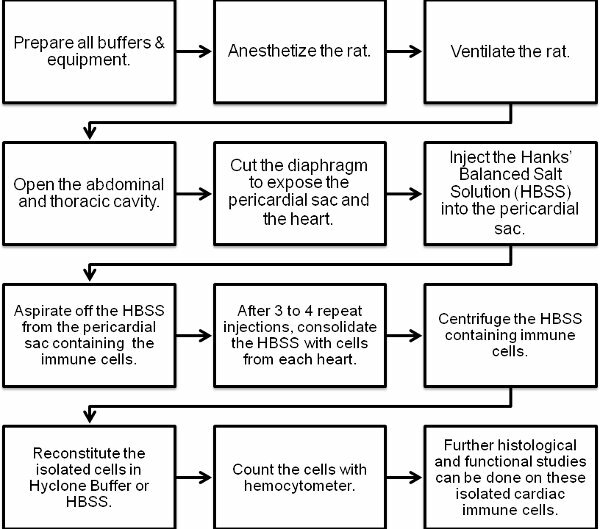 Flow chart of the cardiac immune cell isolation procedure. Figure 2. 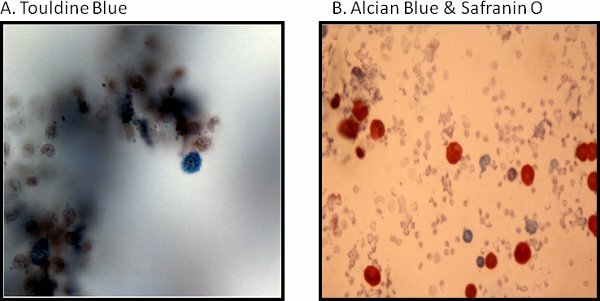 Histological representative images of cardiac mast cells are stained as follows: (A) with toluidine blue and (B) are safranin O/alcian blue. Figure 3. 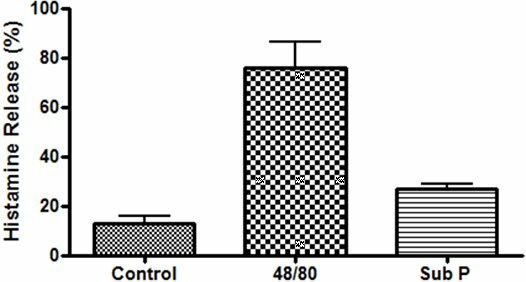 Functional study of cardiac mast cells isolated from the epicardial myocardial region and stimulated with compound 48/80 (10μg/mL) and substance P (10μM). Figure 4. 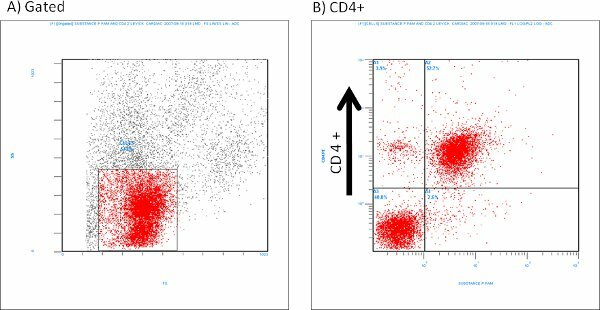 Representative flow cytometry scatter plots of isolated CD4+ cells labeled with Substance P (1:100 dilution). Figure 5. Representative flow cytometry of isolated CD8+ cells labeled with Substance P (1:100 dilution). This method of isolating cardiac immune cells enables the analysis of their function, phenotype, and maturity without the unwanted activation that typically occurs during a traditional enzymatic digestion isolation technique. The average total number of cells obtained with this technique is around 400,000 per rat heart, and differential staining and flow cytometry analysis of these cells indicates mixed population of T-lymphocytes (~70%), macrophages (~12%) and mast cells with the use of this technique. (~12 %).13, 14 Therefore, purification methods for further separation of cardiac immune cell populations are needed. 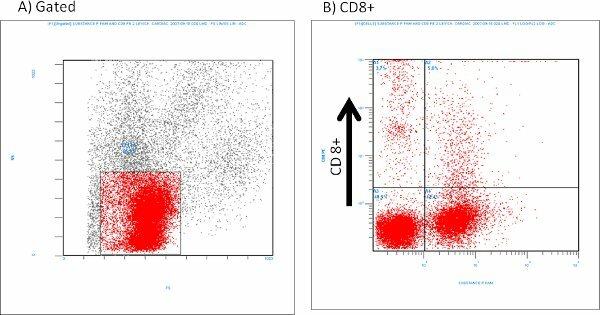 Isolated immune cells can be used for multiple applications including functional studies, flow cytometry, immunofluroescence, and co-culture experiments. With further purification and experimentation, these isolated cells provide a useful tool for understanding the role of the immune system in the process of cardiac remodeling. Rats were housed under standard environmental conditions and maintained on commercial rat chow and tap water ad libitum. All studies conformed to the principles of the National Institutes of Health Guide for the Care and Use of Laboratory Animals and were approved by the University of South Carolina Institution's Animal Care and Use Committee. Anesthesia at the experimental end point was affected by ketamine/xylazine cocktail at a ratio of 2 ketamine to 1 xylazine. This is a nonsurvival procedure, which permits the use of unsterilized instruments. After the isolation of immune cells and other desired tissue, the rat was rapidly and humanely euthanized according to the American Veterinary Medical Association Guideline on Euthanasia for rodents (e.g. exsanguination, cervical dislocation, or anesthetic overdose). This work was supported by a UNCF-Merck Graduate Science Research Dissertation Fellowship (J.L.M. ), National Heart, Lung, and Blood Institute grants RO1-HL-62228 (J.S.J.) and RO1-HL-073990 (J.S.J.). Solution as a part of the procedure. 12 N HCL Fisher Scientific CAS 7647-01-0 For 6 N, add equal volumes of HCL to deionized water. 10 N NaOH Fisher Scientific SC267 For 5 N, add equal volumes of NaOH to deionized water. Small Animal Ventilator CWE, Inc. SAR-830 Set breathing rate to 40.5 breaths per min. Bevel 18 gauge needle BD Biosciences 305199 Trim needle by 1/2 to 3/4 of its original length for use as a tracheal tube. Teflon Tip (with needle removed) of 24-gauge Baxter quick-cath catheter Baxter Internationl Inc. 2N111 Reduce the Teflon Tip length by 1/2 to 3/4. Sorvall RT6000B Refrigerated Centrifuge Fisher Scientific 75-004-377 Remember to pre-cool and keep at 4°C. Brower, G. L., Chancey, A. L., Thanigaraj, S., Matsubara, B. B., Janicki, J. S. Cause and effect relationship between myocardial mast cell number and matrix metalloproteinase activity. Am. J. Physiol. Heart. Circ. Physiol. 283, H518-H525 (2002). Brower, G. L., Janicki, J. S. Pharmacologic inhibition of mast cell degranulation prevents left ventricular remodeling induced by chronic volume overload in rats. Journal of Cardiac Failure. 11, 548-556 (2005). Chancey, A. L., Brower, G. L., Janicki, J. S. Cardiac mast cell-mediated activation of gelatinase and alteration of ventricular diastolic function. Am. J. Physiol. Heart. Circ. Physiol. 282, H2152-H2158 (2002). Levick, S. P., Gardner, J. D., Holland, M., Hauer-Jensen, M., Janicki, J. S., Brower, G. L. Protection from adverse myocardial remodeling secondary to chronic volume overload in mast cell deficient rats. Journal of Molecular and Cellular Cardiology. 43, 56-61 (2008). Levick, S. P., McLarty, J. L., Murray, D. B., Freeman, R. M., Carver, W. E., Brower, G. L. Cardiac Mast Cells Mediate Left Ventricular Fibrosis in the Hypertensive Rat. Hypertension. 53, 1041-1047 (2009). Batista, M. L., Santos, R. V., Cunha, L. M., Mattos, K., Oliveira, E. M., Seelander, M. C. Changes in the pro-inflammatory cytokine production and peritoneal macrophage function in rats with chronic heart failure. Cytokine. 34, 284-290 (2006). Galli, S. J., Tsai, M. Mast Cells: Versatile regulator of inflammation, tissue remodeling, host defense and homeostasis. Journal of Dermatological Science. 49, 7-19 (2008). Yndestad, A., Holm, A. M., Muller, F., Simonsen, S., Froland, S. S., Gullested, L. Enhanced expression of inflammatory cytokines and activation markers in T-cells from patients with chronic heart failure. Cardiovasc. Res. 60, 141-146 (2003). Bozkurt, B., Kribbs, S. B., Clubb, F. J., Michael, L. H., Didenko, V. V., Hornsby, P. J. Pathophysiologically Relevant Concentrations of Tumor Necrosis Factor-ɑ Promote Progressive Left Ventricular Dysfunction and Remodeling in Rats. Circulation. 97, 1382-1391 (1998). Frangogiannis, N. G., Lindsey, M. L., Michael, L. H., Youker, K. A., Bressler, R. B., Mendoza, L. H. Resident Cardiac Mast Cells Degranulate and Release Preformed TNF-ɑ, Initiating the Cytokine Cascade in Experimental Canine Myocardial Ischemia/Reperfusion. Circulation. 98, 699-710 (1998). Jobe, L. J., Melendez, G. C., Levick, S. P., Du, Y., Brower, G. L., Janicki, J. S. TNF-α inhibition attenuates adverse myocardial remodeling in a rat model of volume overload. Am. J. Physiol. Heart. Circ. Physiol. 297, H1462-H1468 (2009). Forman, M. F., Brower, G. L., Janicki, J. S. Spontaneous histamine secretion during isolation of rat cardiac mast cells. Inflammation Research. 53, 453-457 (2004). Levick, S. P., Murray, D. B., Janicki, J. S., Brower, G. L. Sympathetic nervous system modulation of inflammation and remodeling in the hypertensive heart. Hypertension. 55, 270-276 (2010). Morgan, L., Levick, S., Voloshenyuk, T., Murray, D., Forman, M., Brower, G. A novel technique for isolating functional mast cells from the heart. Inflammation Research. 57, 241-246 (2008).